The claims raise new questions about the status and extent of Iran’s nuclear progress as negotiations between Tehran and the West approach their Nov. 24 deadline. New information about the purported explosive chambers—as well as Iran’s elaborate network of front companies and organizations meant to obfuscate this nuclear work—was released on the same day that the United Nations’ nuclear watchdog accused Iran of failing to address key questions about it’s nuclear program. "Today's information uncovers a simple truth: The clerical regime is ceaselessly and secretly forging ahead with the military dimensions of its nuclear program and has no intention whatsoever of abandoning that program," Soona Samsami, the NCRI's U.S. representative, told reporters at a press briefing. Construction of these chambers, which could have helped Iran make key advances on the nuclear front, was undertaken as part "of a highly classified special project" known to only the highest-level Iranian officials, according to the NCRI. "The chambers were to be used for special tests, particularly for high explosive impact as part of the nuclear weapons program of Iran," the NCRI claimed. The organization says that it has shared this new information with the U.S. government as well as the International Atomic Energy Agency (IAEA). One of the two chambers is said to have been installed at the Parchin complex, the site of a recent explosion that killed two. It is unclear where the second purported chamber currently resides, the NCRI said. "This is the question that the IAEA" should immediately take up and pursue, said NCRI’s Alireza Jafarzadeh, who conducted a presentation for reporters about the new information. "We don’t know where the other chamber is," Jafarzadeh said. "It could be at another site where they’re doing similar activities. It could even be in Parchin and we’re not aware of it. We know for sure that there were two such chambers built." "There’s no benign use behind the second chamber," he said. "The question is where is it and what are they doing with it now?" "The concern anyone would have and the IAEA should have is, ‘What happened to that second chamber?’" he said. "This is something the IAEA should immediately ask Iran to clarify." In addition to the claims of a second explosive chamber, the NCRI published the names of several organizations and individuals that it says are responsible for obfuscating Iran’s ongoing nuclear work through an elaborate network of front companies. The top Iranian official in charge of "the design and installation of the explosive chamber" is an IRGC official named Saeed Borji, according to the NCRI. "The explosive chamber(s) installed and used at Parchin Miliary Complex were part of a project that began under the supervision of the nuclear weapons division of Iran," the NCRI claimed in materials provided to reporters. "Mohsen Fakhrizadeh Mahabadi, the key figure for the Iranian regime’s nuclear weapons program, headed the project," according to the NCRI. Iran covered its tracks by establishing front companies and research organizations that claimed to be doing work in the field of nanodiamonds, or small diamonds that can be created through a detonation. Foreign experts from Russia, Belarus, and Ukraine were employed in the past by Iran to help with this work, the NCRI claimed. "These are questions, outstanding questions that get to the core of the nuclear program of Iran," Jafarzadeh said. 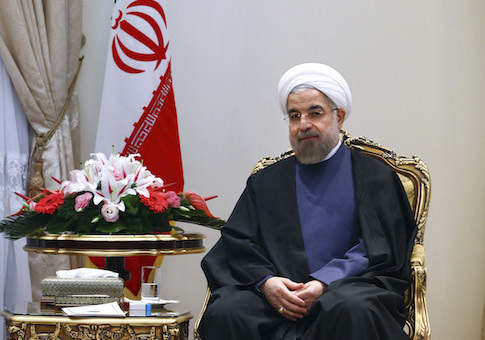 "The entirely nuke structure of the Iranian regime remains intact." When asked about the new information in a State Department briefing, spokesperson Jen Psaki said, "We’re aware of the claims that were made, but we don’t have any comments on the substance." "Iran has not provided any explanations that enable the agency to clarify the outstanding practical measures," the IAEA report said, according to Reuters. This entry was posted in National Security and tagged Iran, Nuclear Weapons, United Nations. Bookmark the permalink.